OKLAHOMA CITY - Energy FC have signed midfielder Josh Garcia, Head Coach Steve Cooke announced today. Garcia, a product of US Grant High School in Oklahoma City, joins the first team after a successful 2018 season as captain of the Energy FC U23 team, where he scored two goals and provided four assists in 11 matches. 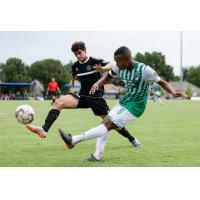 Garcia participated in Energy FC's open tryouts in 2018 and earned a spot on the U23 roster as well as the opportunity to train with the first team. Prior to his time with the Energy FC organization, Garcia played collegiately at Northern Oklahoma College and Friends University. During his high school career at US Grant, Garcia led the Generals to the playoffs three consecutive years and earned second-team All-City honors as a senior. "Josh had a really good season in our PDL team," said Cooke. "We worked with him all preseason so that he could be ready for the PDL season. When he played in our U23 team, for me, he was the standout player. Not only for his performances but because his performances were very consistent, hardworking and also in a variety of positions. I think Josh can be a good contributor in any of the right wing, left wing or number 10 positions, and I think he brings a great deal of versatility to our squad." In addition to his technical ability, Cooke also made mention of Garcia's abilities away from the pitch. "The number one thing I would say with Josh Garcia is that his life story is one of real inspiration - inspiration for me as well as everyone else. He's one of the greatest people I've ever met in my life. He's a person who always perseveres and sees the future for himself being a really bright one. I know that in his life he's overcome a lot of adversity, and he's really only just growing into his playing career. "Obviously, he's a local Oklahoma City boy, and I think a lot of young players are going to look to Josh for that little bit of inspiration and that vision of where they can also go in their careers. I couldn't be prouder of him, and I couldn't be more pleased to be able to bring him into the group."